Because each whorl represents one year of growth, age on young trees with determinate height growth can be estimated by counting the whorls. 1. On most trees, the lowest tree branches are systematically dropped as the tree grows and the sun no longer hits the base of the tree. Therefore, when estimating age using this method, it is important to include the bottom-most stubs and/or knots where it is evident branches once existed. 2. Two to four years should be added to most species to allow for the time between seedling germination and evidence of branch whorls on the trunk (Figure 4.4). 3. Small single branches between major branch whorls do not constitute a true whorl or year of growth. Do not count these false whorls. 4. A very short increase in length between whorls that seems unlike the other years’ growth may indicate a “lammas” year, in which the tree flushed twice, often in response to extraordinary growing conditions. Ignore those years unless it is evident that some injury is responsible for the very short internode (Figure 4.4). Figure 4.4. Counting the whorls to determine age of a young conifer. Lammas growth and false whorls are ignored. The lower stem is examined for knots, and years to first visible knot is estimated and added in — generally 2-4 years. 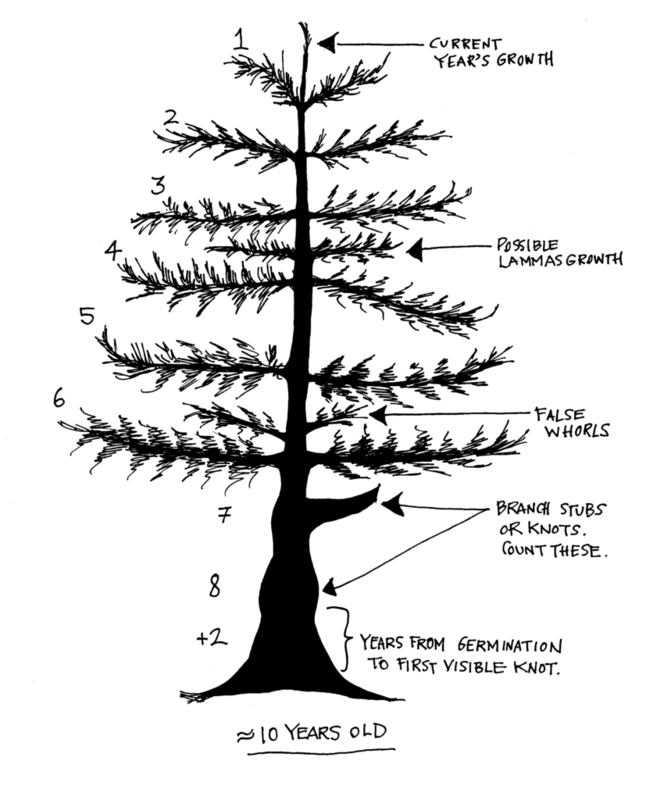 This method of “counting the whorls” usually works very well up to fifteen years of age or so for conifers such as Douglas-fir, spruces (Picea spp. ), pines (Pinus spp.) and true firs (Abies spp.). It is more challenging for cedars (Thuja spp., Chamaecyparis spp. ), hemlocks (Tsuga spp. ), and some hardwoods. One really has to get close to the tree, look carefully for evidence of bud scars, and know the growth habits of these species.